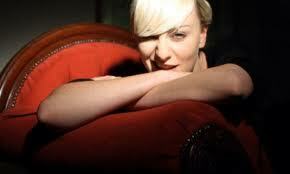 Cathy Davey is a singer songwriter from Dublin and one of Ireland's finest, in my opinion. I love everything about this lady, her witty and quirky lyrics, her ability to mix a multitude of genres, her cool attitude and her voice. Her voice is so sweet and candy coated, I just can't get enough of her stuff. She's had three albums out to date, all of which come highly recommended. She's also rocking live so if you get a chance to see her, do so. Here's the brand spanking new video for her song 'Little Red' which I saw on the excellent Nialler 9's blog. The video is a tad creepy but really imaginative and suits the song. It's taken from the album 'The Nameless' which is a masterfully crafted record and a lot more mature and knowing than the previous two. And here's an oldie too, for your listening pleasure, 'Clean and Neat' taken from 2004's 'Something Ilk'. Cathy rocks!